Once a snake is agitated or frightened, it is difficult to calm him down, and usually requires returning him to his cage. Keeping snakes relaxed during handling sessions begins with ensuring that they are stress free while in their cages, which helps them to remain calm when interacting with their keepers. When handling snakes, be sure to do so in a quiet room, free of other pets and people and avoid restraining them unnecessarily. Quick movements can frighten snakes and send them into fight or flight mode. Slowly lift snakes from their enclosures, without quick movements. Sit on the floor and allow your snake to explore the change in surroundings. Large audiences, family pets and bright lights can make snakes nervous -- limit these types of distractions when handling snakes. Snakes typically react to handling with fear or, if they are calm and relaxed, curiosity. Frightened snakes typically do not move very much, or they retreat to defensive postures. Curious snakes are not in a state of acute fear, and crawl around slowly and deliberately, flicking their forked tongues frequently. In the wild, the only animals that grab or restrain snakes are those which seek to eat them -- even calm snakes are likely to become anxious if grasped. Always seek to support your snake fully, and allow them to hold on to you rather than trying to hold on to them. 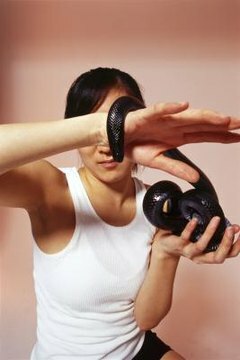 Keep your hands open and relaxed -- with a little practice, it becomes easy to control snakes in this manner. It isn’t possible to change snake personalities overnight -- it may take months to convince your snake that you are not a threat. When trying to condition nervous or untrusting snakes, keep handling sessions brief. If at any point in the interaction, your snake becomes agitated, slowly place him back in his cage and allow him to calm down. Give him a few days to relax, and try to handle him again. In order to keep your snake calm while you are handling him, you must ensure he is calm while he is relaxing inside his cage. Most snakes do not enjoy feeling exposed, and they spend most of their time hiding from predators. Provide your snake with at least one secure hiding space; if possible, place several hiding spots throughout the enclosure. Hiding places should be dark and fit your snake snuggly; snakes like to feel contact with the inside of the hide. Commercial plastic hides, flat pieces of cork bark and modified plastic tubs are all suitable options.